Being able to build and manage a successful team is a qualification for many different types of jobs. When you’re being considered for a position that requires managing or being part of a team, you will need to show that you have the team building skills necessary for the job. What Is Team Building and Why Do Companies Want It? Team building is the making of cohesive working groups where all members feel invested in the direction taken and results achieved by the team. All members have input towards developing group goals and defining the steps taken to reach those goals. Everyone is able to work together to achieve the group's objectives. Employers believe that highly collaborative teams will add value through greater productivity, higher morale, less counter-productive conflict, and better customer relations. 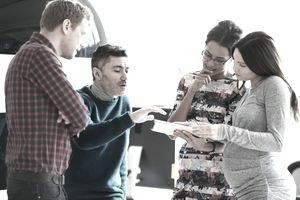 Some organizations use team building to spur productive competition between groups such as sales teams covering different products or regions. Basically, when a group works well together, it tends to achieve the best results. Employers, therefore, want to hire people with team building skills. These are people who can get groups to work together well and meet their goals. Team building skills are particularly important in managers, supervisors, and outside consultants who oversee groups of employees. As you search and apply for jobs that involve team building, use the skill words listed here to further your job searching. For example, apply the terms in your resume, especially in the description of your work history. You can also incorporate them into your cover letter. Mention one or two of the skills mentioned here, and give specific examples of instances when you demonstrated these traits at work. Each job will require different skills and experiences, so make sure you read the job description carefully, and focus on the qualifications listed by the employer. You can also review our lists of skills listed by job and type of skill. If you are helping to unite a team, you need to have strong communication skills. Using both written and verbal communication skills, you will have to explain company goals, delegate tasks, resolve conflicts between members, and more. It is important that you are able to clearly express ideas to teams. In order to problem solve and make sure every team member feels heard, you will also have to listen. You will need to understand the concerns of every member so that they each feel they are being considered and appreciated. When team building, you will need to solve problems. These might include problems related to the group’s goals. However, these might also include interpersonal problems between group members. A team builder must help to resolve both. He or she needs to be a mediator who can listen to two sides of a problem and help everyone come to an agreement. The goal of a team builder is to solve problems in a way that helps the team achieve its goals and keeps its members working well together. Being a team builder often requires taking on a leadership role for a team, at least part of the time. You need to make decisions when there is conflict, establish group goals, and manage team members who are not producing their best work. All of this requires leadership and management. While being a good leader is important in team building, so is being a good team player. You can help build a strong team by showing the team what it means to work well in a group. You will need to collaborate and cooperate with team members, listen to their ideas, and be open to taking and applying their feedback. A team builder gets other team members excited about setting and achieving project goals. This kind of motivational energy can take many forms. Perhaps you come to work every day with a positive attitude, or maybe you encourage your other teammates with positive feedback. Another way to motivate team members is to provide incentives. These might range from bonuses and other financial rewards to extra days of fun group activities. A team builder can think of creative ways to inspire the team to do its best. A good team builder knows he or she cannot complete group tasks alone. Team builders clearly and concisely lay out each team member’s specific responsibilities. This way, everyone is responsible for a piece of the group goal. Good delegation leads to project efficiency, and can help a group achieve a goal on time or even ahead of schedule. To work effectively, team members need to receive feedback on what they are doing well and not so well. They need feedback on both group and individual levels. A team builder knows how to praise and point out progress, but he or she also knows how to provide constructive criticism. He or she must train and advise team members so that everyone is doing his or her best, allowing the team to do its best.